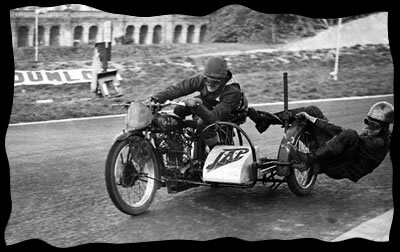 While it is not essential to understand the theory of riding a motorcycle and sidecar it certainly helps, so here goes. The first thing to understand is that the motorbike with the sidecar will feel nothing like the motorbike without the sidecar. Riding a sidecar combination has nothing at all to do with riding a motorcycle, or driving a car, or trike, or any other vehicle you may have experienced. A sidecar combination is not symmetric so turning left is not the same as turning right. The most basic part of riding is to understand what should and should not happen BEFORE you try and ride it. When you accelerate all the power delivered through the rear wheel which is on the right of the vehicle so the vehicle will be getting pushed forward and to the left. When you close the throttle on the bike, only the bike will slow down so the vehicle will be pushed to the right. The trick to riding one is to use this left and right push to help you. 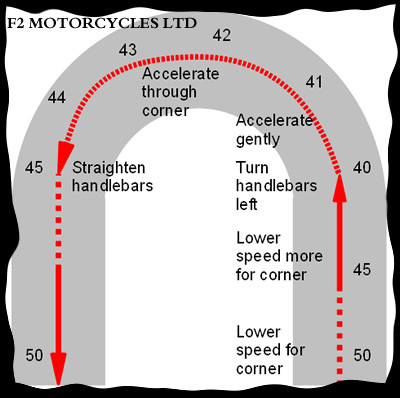 So on left hand corners go in very slowly, turn the bars to the left and accelerate slightly to drive the bike round the sidecar. 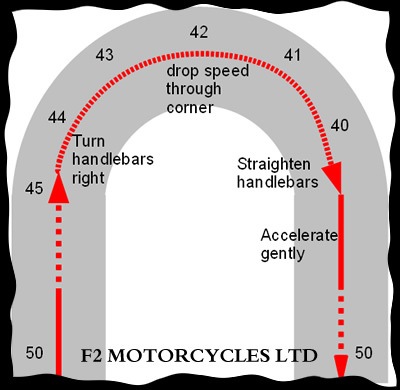 On right hand corners go in slightly faster then seems natural, turn the bars to the right and roll the throttle off slightly allowing the sidecar to swing round the outside of the bike. All combinations shake the bars a little at low speeds, be prepared for it but don't be scared of it. Pick a very quiet location and time, even busy areas have times in the early hours when there is not much traffic. Add between 20 and 40 kg of ballast to the sidecar, plastic bottles of water are ideal. Motorcycle combinations can get very out of control in a very short distance at a very low speed. If all else fails, hit the kill switch and brake. Adding weight to the handlebars helps reduce the handlebar shake at low speeds. Move slightly back in the saddle so you lean forwards with your arms relaxed and bent slightly. You should have more weight on the bars then when riding a solo. Pull away in a straight line feeling for the slight push to the left as it picks up speed. Then close the throttle and feel for the pull to the right as you brake to a stop. Try this a few times until you get the feeling for when the handlebar shake starts and how wild it is. If at this point it is wild, try leaning forward more. Do not lock your arms as this will only make it worse. Once you have a feel for this and are comfortable with the width of the combination try going for second gear. Remember as you clutch in it will move to the right and as you bring the power back on in second gear it will move back to the left like a small S shape wobble. The smoother you change the less this will happen. Once you are in second you will be able to get enough speed up to ride right through the shake, but remember it will reappear as you slow down again. All you have done is gone up and down in a straight line so far. Having mastered pulling away, driving through the shake and stopping in a straight line you will want to try some gentle corners. All sidecars can and do lift off the ground if you turn left too quickly, so take it easy. Try going right first. Pull away and get some speed up in second or third, when you want to turn right turn the bars to the right by pushing with your left palm at the same time decrease the throttle slightly. If you have only ever ridden solo bikes turning the bars will feel odd, they need to turn further than you think. All direction changes should be done by pushing with your palms, always add weight to the bars, never pull with your fingers. Pulling the bars gives much less control, and takes weight off the bars. Pulling is much more likely to cause handlebar shake. If the front wheel is not pointing in the direction you want the combination to go it will not go there. Even at low speeds you should be able to feel the sidecar swing round when you close the throttle. 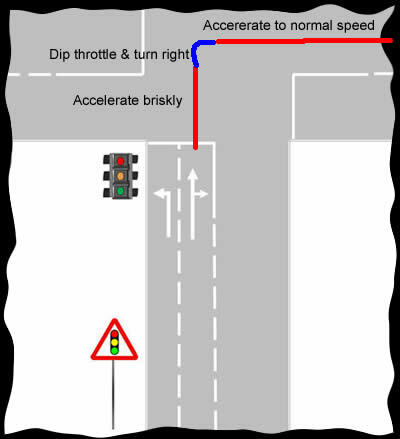 In the diagram above there is a 45 mph right hand corner joining two 50 mph straight roads. When turning right you should enter the corner at a high enough speed to carry the sidecar round the bike as you close the throttle slightly and still leave the corner at the correct speed. In this case you would enter the 45 mph corner at 45 mph or faster and drop progressively to 40 mph on a trailing throttle through the corner. Turning left can seem a little frightening at first, but with care this can be the most exciting part of sidecar riding. Pull away again and get past the bar shaking speed then when there is plenty of room turn the bars to the left by pushing with your right palm and increase the throttle very slightly to power the bike round the sidecar. I strongly recommend you have plenty of space because if the sidecar does lift you can then let the bars come a little way back to the straight ahead and the sidecar will land without bouncing. Don't panic and turn hard right to bring it down as this will slam it in to the ground and cause it to bounce. Also do not close the throttle once the sidecar has lifted as this can cause a rollover in severe cases. In the diagram to the left there is a 45 mph left hand corners joining two 50 mph straights. When turning left you should enter the corner at a low enough speed to allow for the increase in speed as you accelerate gently round the sidecar. In this case you would enter the 45 mph corner at or below 40 mph and accelerate progressively up to 45 through the corner. There will be situations when accelerating gently to turn left and rolling the throttle off slightly to turn right can not be achieved. The following few examples are worth considering. Turning right out of a minor road onto a main road. The bike will be stationary as you wait for a gap. You have to accelerate in order to move, but you also need to turn right. On a wet road (or with a powerful bike) it is possible to turn the bars right and accelerate only to find the two forces have canceled each other, so it goes in a straight line forward with the bars still pointing right. The correct procedure is to split the manoeuver in to smaller stages. First accelerate briskly in a straight line to the center line of the main road, then turn the bars sharply to the right. At the same time dip the throttle fairly sharply, just for a moment before bringing the power on to accelerate up to the speed required for the main road. As you do the throttle dip the sidecar will swing round the bike surprisingly quickly and if you have got all the timing correct the bike will still be moving and it will be on the correct side of the road, facing the correct direction. Turning left going down a steep hill. This is never going to be easy. You need to keep the speed down, and possibly even be braking if the hill is really steep, but turning left is easier while accelerating. There really is no clever tricks for this. If its a long hill with loads of corners try scrubbing off additional speed on the short straights. Even if it just means the brakes can be released a little on the left corners, it all helps. The important thing is not to let the whole thing run away. NEVER put yourself in the situation where the entry speed is already too high for a left hand corner. The purpose of this page is to give you the basic theory and enough information to be safe on the road. There are many techniques to learn, but for the first few months just take it easy, concentrate, read the road and enjoy riding the motorcycle and sidecar. Please stay safe, know your limitations, and take the time to really feel at one with the motorcycle combination. They are a lot of fun, even at low speeds. But remember, like any vehicle they can cause serious injury or worse if ridden by someone with more confidence than ability.